Leor Pantilat & Uli Steidl hold the FKT, 12h17m, set on August 16, 2012. The following description of the Ptarmigan Traverse is taken from www.summitpost.org: "The Ptarmigan Traverse is perhaps unique in Washington: a week-long, off-trail high route weaving between the glaciated peaks of the North Cascades, never straying far from the crest. The Ptarmigan is not for hikers, so much as for climbers, and experienced ones at that. Essentially a mini-expedition, it requires off-trail wilderness navigation, extensive glacier travel, self-reliance, and commitment. The rewards are the views, the climbs of peaks so remote that this traverse is their most common approach, and the adventure of it all. The traverse is usually completed in about a week, most commonly in July or August, and usually done from north to south. How and when you accomplish it is entirely up to you and your partners. Race through it in three days or take two weeks to climb every nearby peak and swim in every frigid lake. It's even been skied in a single day." 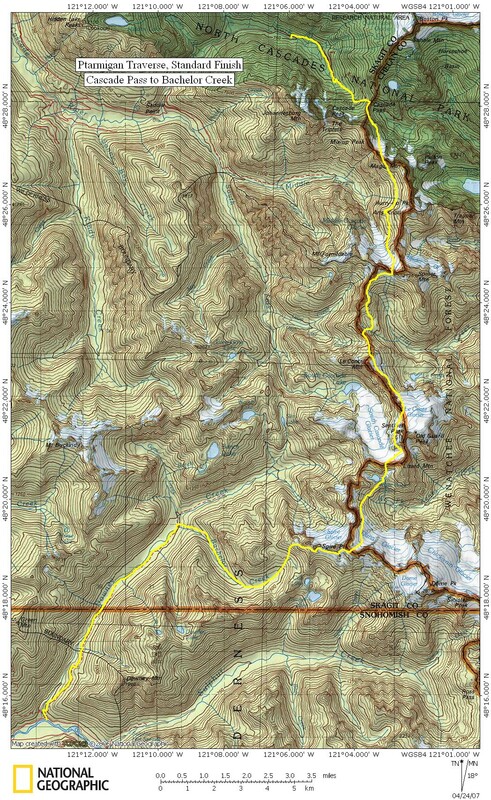 The www.summitpost.org page has a ton of details about this route. The Ptarmigan was apparently first done in 1938 by members of the Ptarmigan climbing club, who took 13 days to do the traverse, climbing many peaks along the way. Lowell Skoog indicates that the Ptarmigan is about 30 miles long with roughly 11,000 feet of climbing. A map of the route is here, which is taken Lowell Skoog. Leor Pantilat and Colin Abercrombie did the traverse in a fast (but not FKT) time of 18h10m on August 14, 2008. They posted a trip report with time splits and many photos on cascadeclimbers.com. "The Ptarmigan Traverse was first hiked in a day in the mid-1980s, I believe. I met one of the guys who did it, but I don't remember his name. I don't know how long they took. Joe Stock and a friend named Andrew [Wexler] hiked the route in 15 hours, 40 minutes on September 4, 2004. Joe submitted a brief story about the trip to the 2005 NWMJ but we decided not to publish it. (I still have Joe's original story and I also have his address.) I don't know if other people have been trying to set speed records. My brother Carl and I probably did the first one-day ski traverse in 1988. Our intention was just to ski the route in a day, so I don't know if we could have gone faster. I believe the route has been skied in a day several times since then. When Carl and I skied the Ptarmigan in 1988 we did most of the trip in plastic mountaineering boots. I think walking the route in lightweight shoes would be faster and you wouldn't need to take ski gear. But skiing was what we wanted to do." 4:30 am Cascade Pass. Talking, excited, calculating. 5:50 am Cache Col. Perfect crisp snow for cramponing. Slow down! 7:20 am Middle Cascade Glacier. Slow down! No max heart rate! Coffee wearing off. Clear. 9:25 am Traverse below Le Conte. Need water. Need shorts, not gore-tex and insulated jacket. Found a pace. 10:35 am Descent to South Cascade Glacier. Andrew's rugby ankles hurt. Spire Col looks close! Confident now. 11:14 am White Rock Lakes. 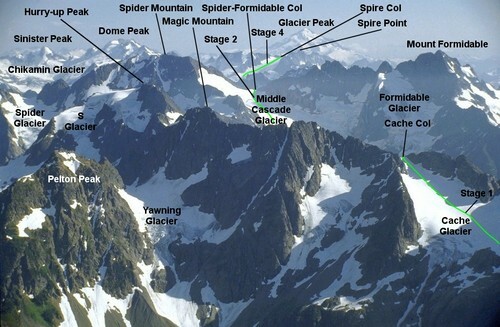 It's only up to Spire Col and down. Isn't that hard to believe? 12:00 am Toe of Dana Glacier. More Cytomax and Pandas. Feeling strong, but feeling it for sure. 1:07 pm Spire Col. Laughing! Light and fast is different! 2:10 pm Cub Lake. Advil for my quads. Relaxing in the sun. Nobody here. 5:00 pm Six-mile junction. Bee stings on my legs. Andrew rolled an ankle. But feeling so strong! 7:05 pm Downey Creek trailhead. Tired, but legs still strong. Kind of disappointed that it is over already. Too easy. 15 hours and 40 minutes. The Skoog's ski trip report is here. Not to be outdone, Abercrombie & Pantilat went returned to the Ptarmigan on July 28, 2009, and laid down the current FKT at 14h36m, over an hour faster than Stock & Wexler. Pantilat posted his usual excellent, detailed trip report with splits, photos and video on cascadeclimbers.com. Leor Pantilat reports below beating his own FKT on August 16, 2012. With Uli Steidl he did the route in 12h17m. Uli Steidl and I lowered the FKT by 2 hrs, 19 minutes completing the traverse 12h17m on August 16, 2012. Photos and more splits here. FKT from trailhead to trailhead maybe, however the original 1938 Ptarmigan Traverse included visiting a dozen summits (including Johannesburg), and probably hasn't seen a repeat to this day. The Ptarmigan was apparently first done in 1938 by members of the Ptarmigan climbing club, who took 13 days to do the traverse, climbing many peaks along the way. For the purpose of recording FKTs, trailhead-to-trailhead seems to be the most agreed-upon method. Or, if so inclined, one could always record a time including X, Y, Z summits... Though since the Ptarmigan essentially is accepted as a high route with the possibility of adding on peaks, TH-to-TH may be the most basic way of recording its FKT, IMHO. Bob Bolton shared this site with me to add some info on the Ptarmigan in a day discussion. In the early 80s, someone asked Jim Dixon how long it takes to do the Ptarmigan traverse. In typical Dixon fashion he started wondering about how fast it could be done. Several of us had been over the route multiple times as 5 or 6 day climbing trips but nobody had tried a blitz over the route. September 5, 1982 a group of five took off from the Cascade Pass trailhead around 4:30 AM or so. We were in Nike Approach shoes, some of the earliest lightweight trail shoes available. Took ice axes, a single 8mm rope, no crampons, large fanny packs with windbreakers and lots of granola bars. Not much else. Oh, 2 flashlights for the group. Snow conditions were quite good that year. Cache glacier was hard snow and tricky hopping snow cup to snow cup in the early morning, but the rest of the route had softened sufficiently to travel quickly in our light gear. I don't have recorded the split times along the way other than we made it to Cub Lake in 13 hours. Out to the Suiattle in 18:14. The trip went smoothly in all sections. We didn't do much running but kept up a good pace throughout without more than a few minutes break at each of the lakes to drink and eat a bar. The team included Jim Dixon, Larry Gohl, Ken Dull, Keith Dull and Gerald Smith. We were all marathon runners and reasonably fit at the time. My recollections of the day are that it never felt very intense or difficult, it just flowed along like watching a beautiful video. Lowell Skoog heard about our adventure over the Ptarmigan from a worker colleague of his, Curt Nelson, who is a friend of mine and has joined me on subsequent traverses of the route. To our knowledge, this 1982 traverse was the first in a day. The latest FKT is really great; more power to you young guys!